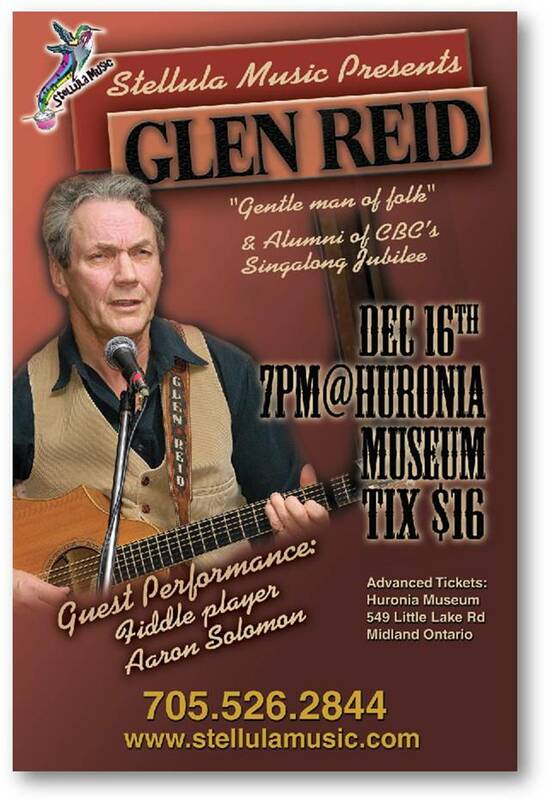 Stellula Music Presents Glen Reid at the Huronia Museum on December 16th at 7:00 PM. Glen Reid is a songwriter and greatly respected luthier from Burk’s Falls, Ontario. Glen was also the Founder and Artistic Director of the Heritage River Festival. The event was held in Burk’s Falls until it evolved into the Almaguin Music Festival in neighbouring Sunridge, Ontario. Performing with an extensive list of Canadian legends, including Fielding, he has become a legend in his own right as a songwriter, festival organizer (Heritage River Music Festival, Burk’s Falls), and luthier making guitars, mandolins and mandolas inspired by the 17th Centurey Portuguese instruments (his creations are owned by musicians like Emmylou Harris and James Gordon). When he was young, word of Reid’s musical dexterity soon spread and the hot 19 year old became a session man, first for Dominion Records and later for Boot Records. Reid backed Blind Freddie McKenna and Stompin’ Tom Connors for several recordings. Glen, became an alumni of CBC Television Singalong Jubilee as a weekly player and frequent featured performer. Glen was also a sideman and a regular performer on John Allan Cameron’s Let’s Have A Caleigh, as well as “The Ryan’s Fancy/Tommy Makem Show, The Harry Hibbs Show, and the George Hamilton IV Show. Reid’s most recognized and recorded song, My Green Valleys, has been recorded extensively in the UK, Australia and Canada, by groups like the Irish Rovers, Tommy Makem and Ireland’s Wolftones. Contemporary country music star Emmylou Harris is just one of Reid’s more notable customers. She has been playing on a Reid-line baritone guitar for years. Advanced tickets are available at the museum. For more information, call us at 526-2844.